Our latest first experience with United Airlines on the route Chicago – Hong Kong/Macau, in Winter 2011, was quite satisfying. We already experienced the First Class from Europe to Far East with some legendary SE Asian airlines, and were expecting much lower service and comfort from a North American airline. Which was not the case. 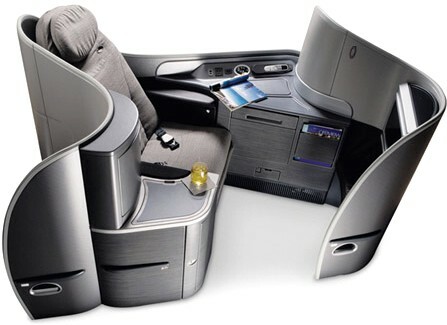 Compared with Thai Airways, from instance, we found the standards higher with United Airlines: much more comfortable cabin, with high tech everywhere and supreme seating. More generous food also. Only Singapore and Malaysian Airlines produced us a better impression. The lounge always gives a real impression of what will follow up once in the sky. Our First Class ticket allowed us immediate admission in the Chicago “United Red Carpet Club”. These renowned lounges await the traveller in over 40 locations worldwide. Tailored made to relax and escape the hustle of the busy international airports, these First Class lounges display their supreme comfort at Chicago O'Hare, indeed, which is the main hub for United Airlines. Centrally located in terminal 1 (concourse C, near gate C18), open 5:00am - 10:00pm, it offers plenty of amenities. We arrived quite in advanced, and could relax a couple of hours in a smooth, sophisticated environment. Like everywhere, snacks, hors d’oeuvres, soft drinks and tea/coffee facilities are parts of the basics. As soon as installed, we were politely greeted by a lovely waitress, who brought us with a minute the complimentary cocktails we ordered her. She offered us to call any local number free of charge, or to use the business center data ports or T-Mobile Hot-Spot WiFi for Internet access. Then she proposed to bring us our favourite daily newspapers and magazines, from quite a large selection unfortunately featuring mostly US (and Japanese!) titles. We were asked if any special requirement, which could make our trip more comfortable. Our limousine and hotels were booked in advance, so we just could say no. 30 minutes before boarding, we were invited to finish our glass of Cointreau and join the departure gate. We boarded the UA 895 flight in priority. The First Class cabin of the Boeing 747-400 was spotless, cozy like a private club. Of course, we cannot compare it with the Singapore Airlines cabin, with its Connolly leather seats and uniformed hostesses. The touch is more American: standard –but very high standard- comfort, with a priority given to high technology. We asked for a glass of Laurent Perrier, and were served champagne Pannier; not a prestigious brand, though quite good. We took off right on time, at 12:17 pm. 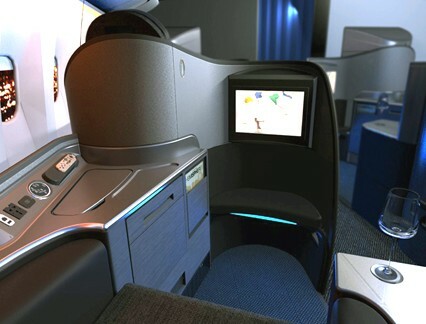 We heard some positive comments about the First Class Suite designed by Mark Peurifoy: one of the most comfortable seats available in the air, now used by United Airlines on most of its intercontinental routes. Once converted in a bed, the seat came perfectly flat; while the cubicle around the top and the feet made us feel pleasantly isolated. If you are tall (or fat), you might find it somewhat narrow; but European and Asian alike would never claim on this matter. Only one remark: the Suites are now long in the tooth, and should be re-upholstered, or replaced. In comparison to some of the newer model first and business class seats on other airlines, UA has a way to go to. They seem not as fresh. We were actually expecting brand new, spotless seats in this category. Our neighbour, a businessman from Michigan, told us that United Airlines First Class was not convenient for relaxing and working, due to the regular invasion of some UA staff on a vacation using the front cabin like their own private club (if not night-club). Frankly speaking, we had different impression; it was 80% empty, and we received the permanent flying crew’s attention. Some readers recently repeated such a claim, so we shall try to check whether or not UA tends to upgrade the vacation staff of the F class. The catering was more than acceptable. Food is served on immaculate linen napkin, along with lovely shaped metal silverware and smart porcelain dishes. Our menu featured quite a decent selection of mouth-watering specialities from UA Executive Chef Gerry Gulli. As an appetizer, we selected the Crab cakes with oven-roasted tomatoes. Surprisingly, it came with a not so appropriate red wine sauce. We also tried the Parmesan and herb crusted chicken breast with aioli (you can order two entries if you like), which was excellent: the flesh was moist, ideally cooked, with a tasty crust. Our main course was a Filet Mignon, roasted with garlic and parsley potatoes. We had it all with a glass of quite an ordinary Kangarilla Road Mc Laren Shiraz 2008, then with a well chilled glass of champagne Pannier. The selection of cheese was quite common (Dutch and US cheese…), and our dessert -Ice cream with sundae toppings- very American. Let’s say that a European touch is missing somehow, and that –like other First Class travellers- we were expecting something like lobster or small portion of Caviar. The flight attendants did a nice job of keeping our wine glass re-filled and being anticipating our needs. We wiped our Cognac, which helped us sleep like a log. We woke up the next day, refreshed, and received a solid American –again!- breakfast. We had cereals with milk and banana, Yoplait fruit yoghurt and vanilla flavoured granola, and a refreshing fruit salad. Fried, scrambled or boiled eggs can be ordered according to your preference. Good choice of hot fresh bread (croissant, bagel, muffin). As smooth as silk landing in the new Hong Kong airport at 6:05 pm, with a direct transfer by jetfoil to Macau. Our conclusion is that we will definitely fly again with UA. We felt safe and pampered during the all trip, and would give a 3-4 out of 5 to their First Class.